It is not breezy. The lore is rich and detailed and getting to know its beauty involves lots and lots of reading and commitment. There is lots to remember and you might find yourself going back to refresh your memory to make sense of things. But if you make the effort, if you allow the fascinating, genre-defining world to engulf you – there is no two ways about it. 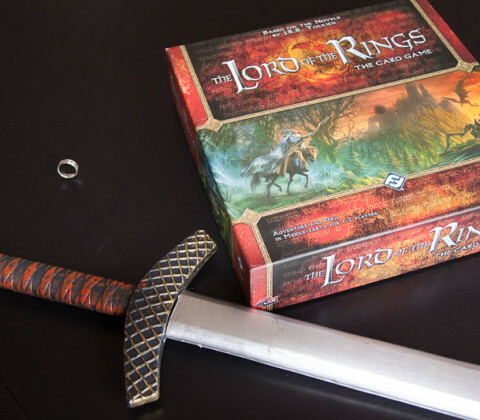 You will love Lord of the Rings and the above applies as much to the Living Card Game as to the books. 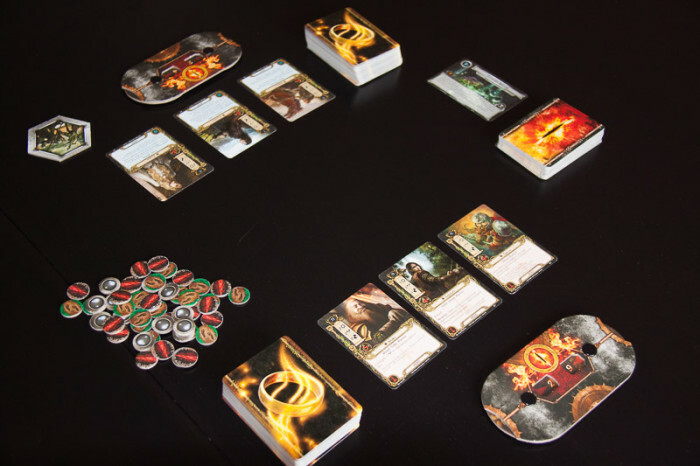 LOTR LCG is a cooperative customizable card game (because of the endless possibilities for expansions it is labeled as a “living” card game). Each game is a scenario that is played out in Middle Earth as 1-4 players embark on a selected adventure. 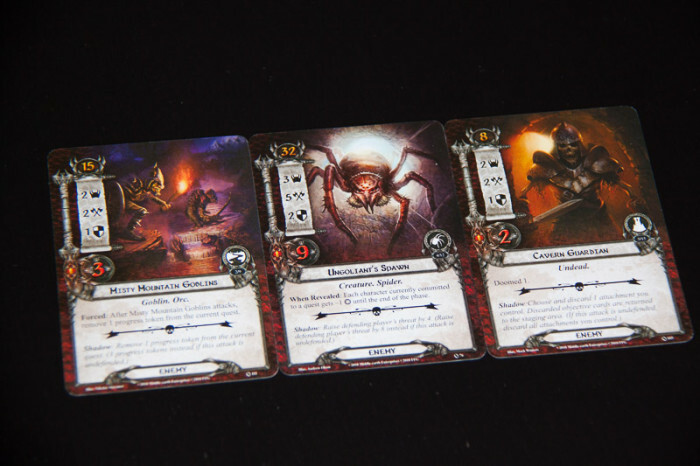 The core set comes with three such adventures of varying difficulty. Each player begins by selecting three heroes that will comprise their team. Heroes belong to one of the four Spheres – different fractions that offer distinct sets of abilities. For example, the Tactics sphere focuses on combat, while Lore is more about healing and obtaining additional information. 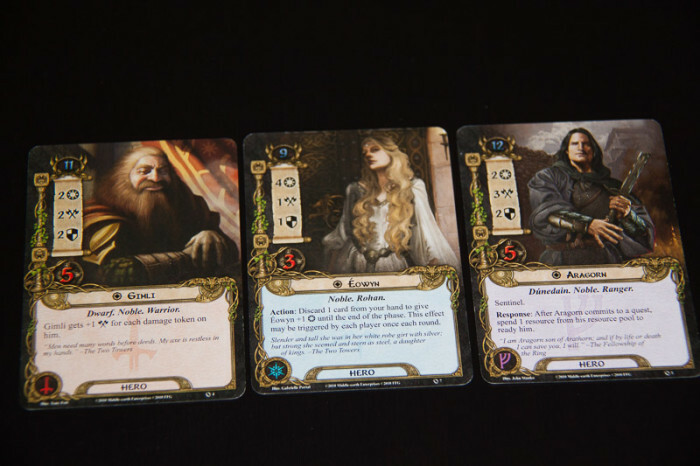 Heroes represent a mix of well-known characters from the novels (Aragorn, Legolas, Gloin) and original ones that fit very well into existing narrative (you could meet them in other FFG games – like Thalin or Eleanor). Each hero has a set of RPG-like characteristics as well as unique special abilities. A two-player game of LotR LCG all set up. The players then have to construct their deck. Initially the pre-made decks from the core set function very well, but eventually you become comfortable enough with the rules that you will want to mix and match cards from different spheres to create a custom powerful deck. The player cars represent allies you can bring with you on adventures, items to outfit your adventurers or events that help you or hinder your enemies. The “feel” of the cards fits very well with their respective spheres – e.g. the sphere of Spirit will have allies that are great explorers and events that allow players to avoid or deal with hazards they encounter while travelling. The scenario you picked will dictate the make-up of the deck you are playing against as well as victory conditions. The game itself consists of a cycle of players sending their characters to explore, making progress towards the current goal, encountering hazards and enemies along the way and overcoming these through wit and combat. Each obstacle card – be it a perilous location or a nasty Warg, create a certain amount of Threat and you have to overcome that threshold by sending adventurers to explore. Fail and the threat can overwhelm you – each player has a counter that rises with each unsuccessful quest, higher threat making you susceptible to negative effects and eventually causing you to lose. A Tactics-focused team with everyone’s favourite Orc-counting duo. The heroes suffered some damage but they have some allies to back them up. You have to be careful not to overcommit characters to exploration though – you have to keep some available if you want them to fight off the baddies. You start with just your heroes but each turn they generate a certain amount of resources that can be used to bring into play cards from your hand, expanding your options and growing your team, allowing you to take on tougher challenges. As you progress through the stages of the quest by defeating monsters, finding objective cards and exploring locations – you get ever closer to victory. If you manage to achieve the win condition of the scenario you are playing (which can be as simple as defeating a monster or as complex as finding an object and exploring wilderness) – the players win. If your threat reaches a certain level or all your heroes are dead – the game is lost and other brave souls will need to give it a shot another day. 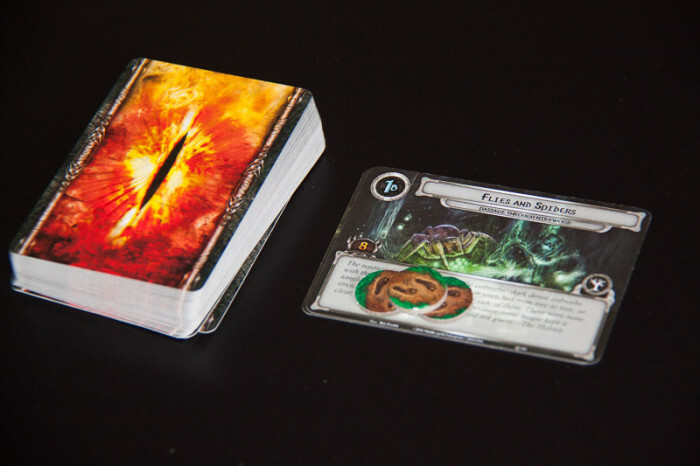 There are two distinct ways to play the LOTR LCG. One is a simple game with pre-constructed decks – just pick a sphere and begin playing. The other invites you to customize your decks and mix heroes from different spheres, thinking about how their respective powers help each other. This is a much more in-depth approach to the game and you can easily spend a good 20 minutes planning and deck building before even starting a game. Beloved characters from the novels await your command. The “simple” way to go works quite well for the times when you want a quick game, but the customized decks are more powerful and if you want to tackle the harder scenarios – you will want to give that a shot. 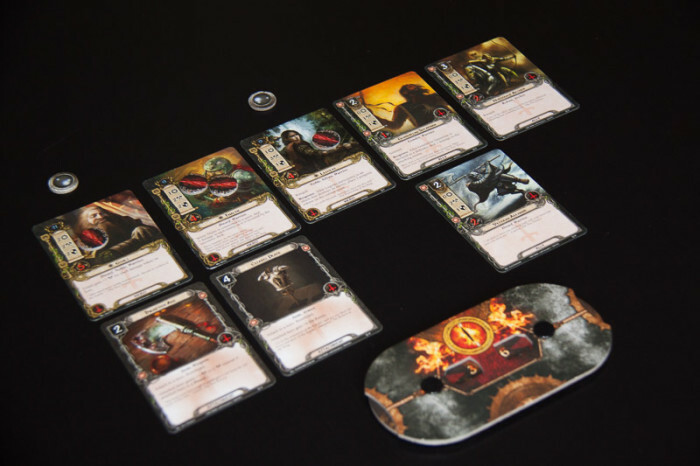 At least the introductory scenario in the core set is perfectly playable without the deck building and lots of enjoyment can be found even without going into the deep end. The core set claims to be fit for 1-2 players but there is no objective reason for it not to be playable with 3 or even 4, if everyone sticks with a single Sphere. The game’s complexity does increase with more players as you have more effects to keep track of, so beginning solo or with two players is advisable. Solo games go very quickly, often fitting into 30 minutes, especially for the less complex scenarios. More complex games featuring more players can easily stretch into the 90 minutes maximum game time – it all depends on the scenario you are playing. With the three scenarios contained in the core set it is only likely with 3 or 4 players. The encounter deck is filled with the hazards and enemies that block your way to victory. The flow of the game depends greatly on the familiarity with the mechanics. There is usually a lot of intricacies to take into account and it takes some time to get a hang of everything and double-check that your reading of the rules is correct. The player interaction comes mostly through discussion of who does what and how well you are going to be able to handle the hazards before you. While not a part of the game – this interaction does engage players in a shared experience and at no point does the game feel like a group solitaire. It does, however, work very well as a solo option, even if it reduces the range of options available to you and forces you to create teams that can do everything as opposed to spreading the responsibilities across several players. The alpha player problem is also not particularly strong – the cards players have are not visible to others and the number of suggestions that to make is limited. Analysis paralysis is not really a problem because most of the time everyone does their thing simultaneously, so it’s not like you’re waiting for the other player just to take your turn. Traps and treacherous locations will give you just as much trouble as monsters. The flow of the game, unfortunately, is sometimes interrupted by an intricate entanglement of the rules that requires clarification before a certain sequence of events unravels. Experience with the rules helps smooth these over, but expect to keep the rulebook handy first dozen or so games. Exactly like reading Tolkien. You keep wondering if all this reading is worth the effort and then something so awesome happens that it does not leave a doubt in your mind – yes, it is totally worth it! The basics of the game may appear over-mechanical in their execution but after playing a few games you start “getting” what story elements are transmitted by abstract notions of “progress tokens”, “shadow cards” and “engagement checks”. The game is built on a sequence of tiny little systems that intertwine with each other, creating a rich variety of scenarios they can depict and tactical options to tackle the obstacles. Goblins, spiders, undead and all manner of foes to test your mettle. Furthermore, by tweaking each of these tiny sub-systems, a game can change, sometime dramatically, and the system smartly uses these changes to tell a story. For example in one scenario, the heroes sail on a boat along a river, while a growing hoard of monsters chases them along the shore. That means that the orcs will not be able to attack you for this stage but once you clear it and hit the shore at the beginning of the next one – you will have to take on all of the baddies at once! However, I hesitate to call LOTR LCG and elegant game. There is A LOT to it and I can honestly say that players have to be comfortable with complexity to tackle this one, especially if custom deck-building and further expansions are of interest. This limits the audience for it, but those who do stick with the game will be rewarded with rich engaging stories in a beloved world. The difficulty of some of the scenarios can also be significant and players should be comfortable with a healthy number of defeats, some due to an uncontrollably crappy card draw. There are ways to mitigate it in game, but sometimes things will go terribly, rocks will fall and everybody will die – be prepared for it. If luck as a factor is a deterrent – steer clear. Finding that approach that finally cracks a scenario that felt impossible does make for some triumphant fist-pumping, that much I can tell you. 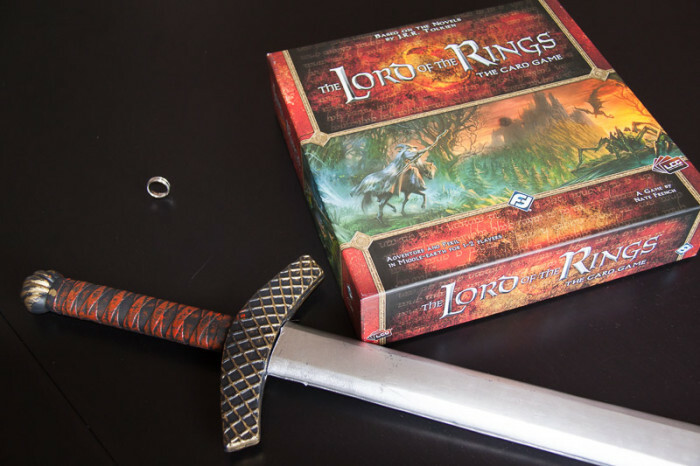 While I think LOTR LCG is a very good game – it is certainly not for everyone and I hope this review explains why. However, the Core Set of the game offers a great way to dip your feet and get a good feeling of whether you would like it or not. If you don’t – you can stop right there and if you do – there is lots and lots (and lots and lots) of expansion materials available – to date there are 62 additional adventures you can buy, each introducing new heroes and player cards that you can use to help you with the old scenarios and the new. The game keeps growing, justifying the “living” name, and there is a vibrant community around it. For example, I highly suggest visiting the Tales from the Cards blog for tactical advice and guides on both playing and purchasing the expansions. It can certainly get pricy, but you can be sure to get significant mileage out of every purchase. Fantasy Flight Games, offering excellent fan support, even has an online hub to track your best scores and gaming stats. 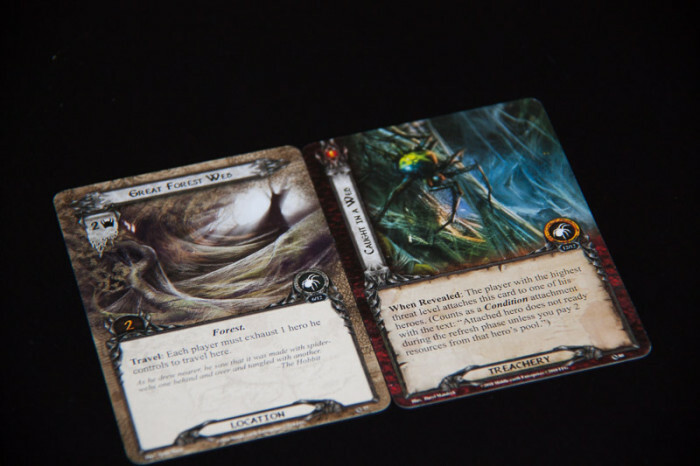 I have to admit that the complexity and level of abstraction in LOTR LCG initially left me lukewarm. I have to offer my sincere thanks to my friend Eric for inviting me again and again to return to this wonderful world that I am now fully committed to. Thank you, Eric! The LOTR LCG rewards those who are willing to put in the effort. If you enjoy Tolkien’s works and appreciate an in-depth, multi-layered game that is highly customizable – give it a shot. Manage your expectations and at worst you’ll play a game you don’t particularly enjoy and at best – will open a whole new gaming universe that you will spend many hours enjoying.